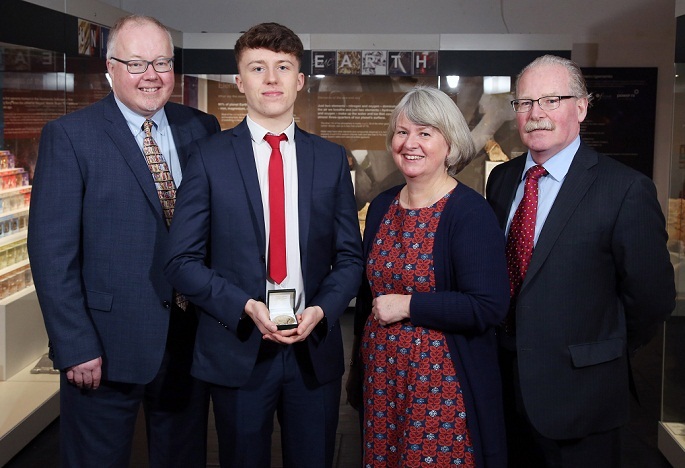 A former pupil of St Colman’s College in Newry has been named the winner of the prestigious Hans Sloane medal which recognises excellence in A level science. The Hans Sloane (Memorial Fund) Trust, in partnership with National Museums NI, was established in 1960 to commemorate the life and work of the celebrated Killyleagh physician, scientist and collector. The Trustees award the Hans Sloane medal to the student obtaining the highest combined marks in biology, chemistry and physics each year at ‘A’ Level, along with their school, to recognise excellence in teaching. Jamie Brannigan, who is now studying Medicine at Cambridge University, was presented the medal and a cheque for £500. St Colman’s College also received a Hans Sloane medal from Professor Tim Harrison, Vice President, Drug Discovery, Almac Group, in recognition of their excellence in teaching. This year, through a new partnership with Almac Group, a global pharmaceutical development organisation headquartered in Craigavon, the cash awards given to the top three ‘A’ level students have been increased and a new award for Northern Ireland’s brightest GCSE students, the Sloane McClay award, has been established. Professor Tim Harrison, Almac, added, “Almac’s partnership with the Hans Sloane Trust enables us to recognise and reward excellence in key STEM subjects across the region. As a global business our success depends on the talent and skills of our most important asset, our people, and it is therefore crucial that we continue to invest in the next generation of scientists, mathematicians, engineers and tech experts. To find out more about the Hans Sloane and Sloane McClay awards, visit www.almacgroup.com/sloanemcclay.